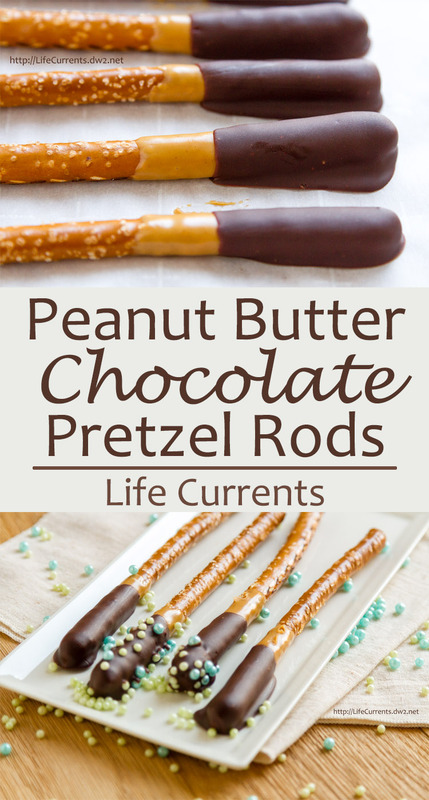 Chocolate Peanut Butter Pretzel Rods for choctoberfest 2016 and Tailgating Snacks Month are a fun dessert snack that everyone young and old will love. They’re super easy to make; your kids will love helping you with these! And, they’re delicious to eat! As far as snacks go, these are fairly healthy. Some peanut butter for protein. Some low-fat pretzels. A little chocolate to sweeten the deal. These are great fun to munch on while watching the game! I wanted a fun easy snack for tailgate snacking. These can be nibbled on while you’re at home or wrap them in individual wrappers for taking them to the game. I found that having the peanut butter and the chocolate in tall jars like mason jars really made dipping the pretzel rods easy. The peanut butter that I buy comes in a glass jar, so it’s really easy to melt it in the microwave. If yours doesn’t come in a glass jar, make sure to put it in a microwave safe jar or bowl before you melt it. For a whole jar of Peanut butter, I pop it in the microwave for 30 seconds, then stir it. I’ll probably need to microwave it again for 20 seconds. My microwave is really strong, so adjust according to how melty the peanut butter gets. You want it smooth and soft. Same idea for the chocolate. Place chopped chocolate in a jar or microwave safe bowl. Melt in 30 second increments until it’s smooth and runny, stirring after each time. Don’t burn the chocolate or it turns into a gloppy hard mess. If you melt it in a bowl, you can then pour it into a tall mason jar for easy dipping. I bought colored sugar pearls on Amazon in my team’s colors. Though, once they came in I think they are a little too pastel to represent the Hawks. These sugar pearls come in all colors, so you can celebrate your team, or a birthday, or just your favorite colors. Check out all the colors here on my Amazon affiliate link. And all today’s Choctoberfest recipes are here! Easy and fun, the kids will love to help make these as well as eat them! Line a large cookie tray with parchment paper. Dip pretzel rods, one at a time, into the melted peanut butter. Allow excess peanut butter to drip off the end, and place the peanut butter coated pretzel rod on the parchment paper. Continue dipping pretzels, once done, place the tray of peanut butter dipped pretzels in the fridge until the peanut butter hardens, about 30 minutes or so. Take the peanut butter pretzels from the fridge and, one at a time, dip pretzels into the melted chocolate. Allow excess chocolate to drip off the end, and place the coated pretzel rod on the parchment paper. Continue dipping pretzels, once done, place the tray of chocolate peanut butter dipped pretzels in the fridge until the chocolate hardens a little, about 5-10 minutes or so. Sprinkle the sugar sprinkles on the chocolate at this time if desired, or roll the pretzel rod around in the sugar sprinkles, both ways work, and it might be easier for little hands to roll them rather than sprinkle. Place the pretzel rods back in the fridge until hard, about 20-30 more minutes. Make as many as you'd like. Make the whole bag, or make only half the bag of pretzels. It's totally up to you! Now that is a wow treat! I know so many people that would love that combination of flavors. Yum! Love the layer of peanut butter in there! Mmmm! Great idea for the PB/Choc combo! Love those pretty decorations, too! What a great idea! This would be perfect for kids to make for holiday gifts. OMG these are insanely brilliant! You make something so simple look so elegant! These pretzel rods look heavenly. They would be a great dish for upcoming holiday parties! My favorite flavor combo! I’d eat these regardless of what color the sprinkles are, Lol!